Bushfire (wildfire or forest fire) risk assessment has been a very common topic in research and practice. Many risk analysis projects, such as identifying likely causes of fire occurrences, mapping fire-prone areas and assessing Bushfire Attack Level (BAL) for buildings, are in place to assist the whole process of bushfire risk & emergency management – from prevention to preparedness to response to recovery. For a fire-prone location in Australia (and in the State of California), API-enabled, site-level location profile report can be produced for innovative fire risk analytics. Independent developers for property location and hazard risk information can integrate the accessible APIs in any third-party applications, so the information and insights revealed be readily shared with the general public and decision makers. For example, these web pages (e.g. Link 1 and Link 2 with Google Maps embedded) are created to allow users to request analytical reports automatically. The Developer Portal provides instructions on how to implement APIs at scale. 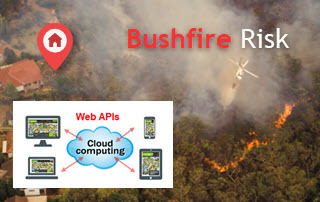 This blog showcases the APIs and information products that are available for site-level bushfire risk analytics. Location profile report for a fire-prone address can be automatically generated and delivered with related APIs. Here we show such reports which were once prepared in response to two recent major fires in Australia and in the US, respectively. Note that for Australian reports, detailed exposure estimates are also included. Quantifying exposure at risk is a generic and useful task in risk analytics. Dedicated APIs have been developed and more information on these can be found in this article “New Methods and Tools (Web APIs) for Innovative Exposure Analytics“. Results on exposure estimation can be reported as a standalone PDF report, or integrated into the main location profile report. Bushfire property damage is generally confined to the bushland-urban interface, therefore to broadly simulate bushfire penetration into urban areas is always handy and insightful. Last year we released a project titled “Visualising Potential Bushfire Risk for Addresses in Australia: A New Cloud-based Approach“, where we focused on visualising bushfire risk in terms of the distance between bushland and exposure locations. Related APIs have been developed and API output is usually shown in GIF animation. A multi-page PDF file (each page showing potential impact areas at a given distance range) can also be generated. 2 – Bushfire prone areas animation. Bushland is classified from the 11 March 2018 Sentinel-2 satellite imagery (soon before the fire). We should note that the above approach is different from the conventional site-level assessment of Bushfire Attack Level (BAL). BAL assessment only considers a number of static factors (i.e. regional Fire Danger Index, slope and aspect of land, vegetation types, and distance between vegetation and the building of interest), and excludes the important factor on prevailing winds. The result (as shown in the following animation) can be used for two purposes: bushfire emergency planning at the broad level, and differentiating potential bushfire risk at the site level. Risk ratings are produced for each direction of the prevailing winds considered. Figure 1: Terrain wind effect in response to direction changes of prevailing winds. Darker colour represents stronger wind effect. The above API-enabled information products are based on our knowledge and preferences. But if you wish to enhance your existing bushfire risk studies (with your own data) by devising similar functions and products, please stay in touch. We offer development services in an efficient manner, for study areas ranging from a small region to a whole country. In addition, we also offer hosting services for the underlying data, analytics and APIs, so you can have a suite of new, accessible bushfire risk analytics products without having to invest lots of time and resources in cloud infrastructure, network setups, computing, etc. The end delivery would be a dedicated website that includes all essential functions and APIs. A full demonstration is available upon request.